Habitats: The last untouched southern shores are found among the islands and submerged reefs that lie within the Life Firing Area. Habitats found here include coastal forest, mangroves, rocky shores, seagrass meadows, rubbly areas and good reefs. Access to the Area is highly restricted as it is regularly used for life firing exercises, see this notice for Sep 2012 in the media. The Life Firing Area includes three large islands of Pulau Sudong, Pulau Pawai, Pulau Senang, as well as three smaller islands and submerged reefs of Pulau Biola, Pulau Berkas, Terumbu Berkas Besar, Terumbu Berkas Kecil, Pulau Salu, Terumbu Salu. Conservation status: Listed for use as 'Open Space' in the URA Master Plan 2008, i.e., "Area to be used or intended to be used as open space". Status not indicated in Parks and Waterbodies Plan and submerged reefs in the LFA are not depicted on both Plans. "Singapore�s surrounding waters bustle with large ships and small all hours of the day, but thanks to effective pollution control, they also teem with a rich variety of marine life. Among our marine treasures are the pockets of coral reefs which flourish to the south of Singapore, in particular around the St John�s Island Group, Pulau Hantu, Pulau Semakau and the Pulau Sudong Island Group. At these marine nature areas, numerous biological communities - corals, sea-grasses, fishes, mangroves, marine mammals, plankton and others - live in an abundance of aquatic harmony. They are a never-ending source of wonderment to divers from Singapore and elsewhere. The government will keep these areas in their natural state for as long as possible." History: On Pulau Senang, there was an attempt to set up a penal reform experiment in 1960. The effort was abandoned after the prisoners rioted and killed prison officers. This is the island where live firing and explosions take place, the scarred centre of the island clearly showing up on Google Earth. Pulau Sudong is said to have been cloaked in mangroves, it has since been reclaimed with seawalls nearly all around its circumference and an airstrip built on it. Pulau Pawai is the least developed of the three large islands with still untouched natural cliffs and flats. 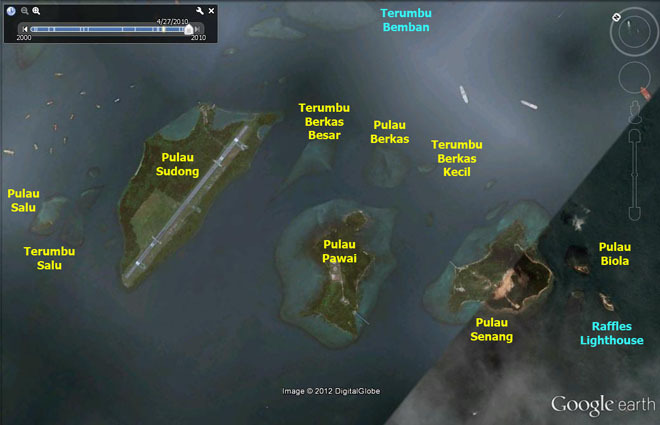 The three smaller islands of Pulau Biola, Pulau Berkas and Pulau Salu, and other submerged reefs remain undeveloped. Pulau Senang, Pulau Pawai and Pulau Sudong on Infopedia by the Singapore National Library (although these entries may have some errors). Coral Reefs of Singapore by Loh Tse-Lynn and the Reef Ecology Study Team, National University of Singapore.